Reading the information below can save you both time and inconveniences. To assure the best experience possible, please read carefully to better prepare for your visit with us. 1What Is The Shops Address? 2What Days And Hours Are You Open? 3Is There Public Transportation Nearby? Yes. Paid parking is available at Queens Center Mall across the street. DO NOT PARK AT ANY OF THE RESTAURANTS ACCROSS THE STREET! Unless you are acually dining there, your car WILL be towed. 5Do You Offer Tattoing Services? 6What Services Do You Offer? We are dedicated in providing you with excellent customer service when visiting our studio, whether you're shopping our gallery of jewelry, getting a new piercing, or are need of assistance with body jewelry change. 7What Kind Of Jewelry, Other Than Body Jewelry, Do You Sell? We carry a variety of jewelry for example rings, necklaces, bracelets, cuffs, and many more unique hand crafted jewelry. 8Do I Need To Make An Appointment For Piercing? No, you do not, but we strongly suggest you do make an appointment to avoid waiting. Depending on the time and day, there can be an estimated waiting time of anywhere between 5-45 mins. 9How Do I Make An Appointment? You can give us a call at (718) 899-7999 and book an appointment with any staff member, or send us a private message via e-mail, Facebook, or Instagram. Yes. A valid (non-expired) government issued I.D. is required for any and every service. 11What Are Your Policies For Minors? For any piercing or jewelry insertion service for a minor, the minor will need a valid (non-expired) government, federal, or state-issued document. The said document shall show their date of birth as well as a photo. A nondriver's license, passport, or NYC ID, satisfies both requirements. In addition, we require a valid (non-expired) government-issued document from the parent or legal guardian that proves they have legal responsibility for the minor. This could include a driver's license with matching last names and addresses to the minor's ID. If the minor and parent or legal guardian do not share the same last name, a birth certificate is required in conjunction with a government-issued photo ID containing a name that appears on the minor's birth certificate, or guardianship paperwork. NYC Identification card Driver’s License, State, Federal ID with the same last name that appears on minor’s ID. Minor’s Birth Certificate required if last names do not match. 12Do You Perform Earlobe Piercings On Children? True Expression respects a parent's choice to professionally pierce their child's ears whether it is for personal or cultural reasons. We ask for the mutual respect of our choice to not pierce children of any age below our personal comfort level. Therefore, we only pierce those who are old enough to ask for the piercing, and can also show us they understand both the responsibility and commitment that comes along with having their earlobes pierced. 13How Much Does Piercing Cost? 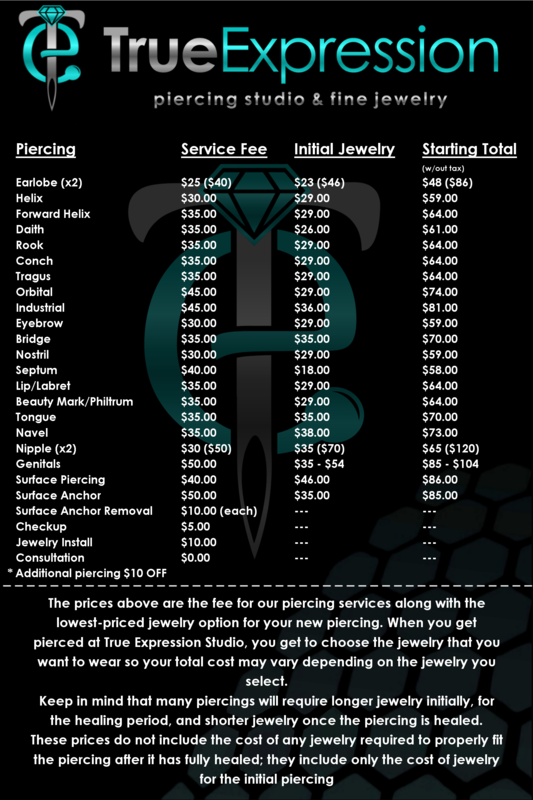 The following prices are the fee for our piercing services along with the lowest-priced jewelry option for your new piercing. Keep in mind that many piercings will require longer jewelry initially, for the healing period, and shorter jewelry once the piercing is healed. These prices do not include the cost of any jewelry required to properly fit the piercing after it has fully healed; they include only the cost of jewelry for the initial piercing. Tips are accepted and greatly appreciated, as in any other other industry, but not necessary. If you prefer- a genuine review on any of our social media platforms is another way to tip. 2Can I Bring And Get Pierced With My Own Jewelry? No. However, when you get pierced at True Expression Studio, you get to choose the jewelry that you want to wear. 3What Type Of Material Is The Body Jewelry You Use Made Of? 4Can I Remove And Switch My Initial Jewelry Myself, At Home? No. Jewelry placed in a fresh piercing should remain inside throughout the entire healing period. If jewelry needs to be switched or removed for any reason, we strongly suggest going to a professional for assistance. 5Can You Change My Jewelry For Me? Yes! Through our safe and sterile techniques, guided by tapers, we can most certainly assist you with such services. 6I'm Having Complications With My Piercing Done Outside Of True Expression. Can You Help Me? Yes! If you fear you have any issues with your piercing, regardless of where or how long ago you got it done, don't hesitate in stoping by! We will more than gladly take a look at it for you, and give you advice on how you can proceed- free of charge. 7Can I Return Or Exchange Jewelry I Purchased? For your health and safety, we do not accept returns, or do exchanges on jewelry. 8The Jewelry I Purchased From True Expression Is Defective Or Broke. What Can I Do? Jewelry with manufacturers defects will be returned to the manufacturer for repair and/or replacement. 9What Type Of Sterilizers Do You Use And How Do You Monitor Them? 10How Long Does It Take A Piercing To Heal? The healing times listed on our Aftercare page are general time frames which vary from person to person. Your piercing may take longer, or quicker than the stated time. Keep in mind that the healing times can be affected by factors like climate, stress levels, diets, and travel. Click here to view estimated healing times. 11I Have To Take Out My Jewelry For Medical Reason/Procedure. Will It Close? Although jewelry can safely be changed after the piercing is healed, bear in mind that the jewelry shouldn't be left out for longer than it takes it to make the switch. A permanent hole can still shrink, making the jewelry reinsertion difficult. True Expression Studio will gladly help you with any type of jewelry handling. 12What Forms Of Payments Are Accepted? We accept Cash, and all Credit Cards (via Clover). We do not accept personal checks of any kind. For any credit card transactions, the cardholder must be present, and ID may be required to verify the cardholder. "Over the phone" payments are not accepted. 13Do You Do Curated Ear Piercings? Absolutely! Every ear piercing we do is “curated” and designed to fit your anatomy and lifestyle. With that being said, all piercings that we perform are always done as so, with proper jewelry suited for each placement. Call it “curated” or piercing, it is what we professional piercers have done, and will continue to do.